Today you’ll see some of the best sights that this beautiful harbour city has to offer, including a tour of the Sydney Opera House. Your Driver Guide will provide expert commentary as you weave your way through the bustling city streets to key landmarks. Discover the stories, history and magic of Sydney Opera House with an incredible guided tour taking you underneath the world-famous sails. Follow your friendly guide inside the World Heritage masterpiece, home to 1,000 rooms, 300 corridors and hundreds of stories and secrets. Step inside the inspired theatres where more than 1,600 performances come to life each year, and learn how Danish architect Jørn Utzon’s groundbreaking design and vision for a world class performing arts venue came into existence. 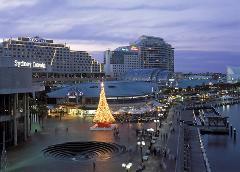 Situated at the very base of the Harbour Bridge, the Rocks is a lively and popular spot for locals and visitors alike. In a time long ago, the area was inhabited by the indigenous Gadigal people, before the first European settlers claimed the land in 1788. Your Driver Guide will share stories, both tall and true, of the characters and events that shaped this port community. From the Rocks you’ll get a stunning view of the Sydney Harbour Bridge, the largest steel arch bridge in the world. Now you’ll head to Chinatown, right in the heart of Sydney. This area captures perfectly the excitement of Asian street life with its bustling restaurants, noodle bars, bargain shopping and Asian supermarkets. Its bright streetscape and lively atmosphere will make you feel as if you are in the heart of Shanghai. Mrs. Macquarie’s Chair sits high on the peninsula known as Mrs. Macquarie’s Point. The chair is an exposed sandstone rock that was hand carved into a bench by convicts in 1810. It is said that Mrs. Macquarie, the wife of the then New South Wales Governor, was known to visit the area to take in the views. 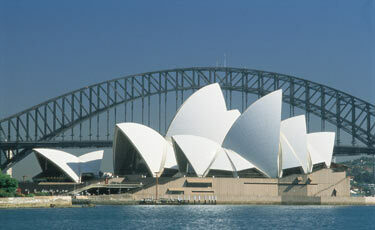 You’ve toured the inside, now you’ll see the exterior of the Sydney Opera House from Mrs. Macquarie’s Point. You must have your camera with you as the panoramic views are stunning. You’re now heading to the entrance of Sydney Harbour, known as the Gap. A dramatic ocean cliff on the eastern coast of Sydney, the Gap will give you breathtaking views of the coastline. 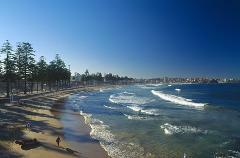 Australians are renowned for their relaxed and outdoor lifestyle and Bondi Beach is a prime example of this. One of the most famous beaches in the world, it is a captivating location brimming with lifeguards, surfers and tanned beach-goers. You can wander along the shoreline and dip your toes into the cool ocean or treat yourself to something from one of the many cafés and restaurants (own expense).